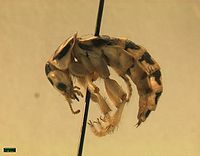 The Pictured Rove Beetle (Thinopinus pictus) is a wingless rove beetle which lives on the sandy beaches of the West Coast of the United States from southern Alaska to Baja, California (Moore 1977). They are nocturnal, and emerge at night from temporary sand burrows to feed on beach hoppers (Orchestoidea) (Craig 1970). Like other Staphylinidae, T. pictus has shortened elytra, so that most of its abdomen is exposed. Males average 1.7 cm, females average 1.8 cm. Males possess a cleft in the last abdominal sternite, which makes them readily discernible from females (Craig 1970). Their cryptic coloration varies geographically in response to lighter colored sand in the southern part of their range. Populations north of central California tend to be darker in response to the dark volcanic sand, while those in the southern range are quite pale. Because of this variation, T. pictus was once thought to be made up of two subspecies (Moore 1977). T. pictus inhabits the sandy intertidal zone. During the day, they hide in temporary sand burrows or under kelp and beach debris. A laboratory study and personal observations have indicated a preference to inhabit the wettest and softest sand available (Craig 1970). At night they emerge and move to the high tide level to find prey (Richards 1982). Individuals switch between inactive ambush predation and active foraging for their prey, which consists mostly beach hoppers (Amphipoda) (Richards 1983). They have also been observed eating beach flies, isopods, and other T. pictus (Craig 1970). Males seem to feed less than females, but are more active than females, possibly to increase the chance of finding a mate (Richards 1983). The breeding season is thought to be from August to October. Dissected females have been shown to carry only 2 to 3 eggs, which are oviposited singly in the sand. These beetles likely have long lifespans in order to reproduce sufficiently (Craig 1970). In the laboratory, eggs hatch at about 14 days. Larvae are whitish with black markings. The length of their instars is unknown (Craig 1970). Craig, P.C. (1970). The Behavior and Distribution of the Intertidal Sand Beetle, Thinopinus Pictus (Coleoptera: Staphylinidae). Ecology 51(6): 1012-1017. Moore, I. (1977). The Color Phases of Thinopinus pictus Leconte (Coleoptera: Staphylinidae). The Coleopterists Bulletin 31(4): 377-378. Richards, L. J. (1982). Prey Selection by an Intertidal Beetle: Field Test of an Optimal Diet Model. Oecologia 55(3): 325-332. Richards, L.J. (1983). Feeding and Activity Patterns of an Intertidal Beetle. Journal of Experimental Marine Biology and Ecology 73(3): 213-224. Richards, L.J. (1984). Field studies of foraging behaviour of an intertidal beetle. Ecological Entomology 9(2): 189-194. This page was last modified on 12 May 2010, at 18:21.